Serizawa Keisuke’s 1974 calendar series is a collection of twelve paper stencils done in the katazome style. This is a technique that Serizawa adopted from textile design in which the artist applies a type of resist paste through a stencil before dyeing the fabric. 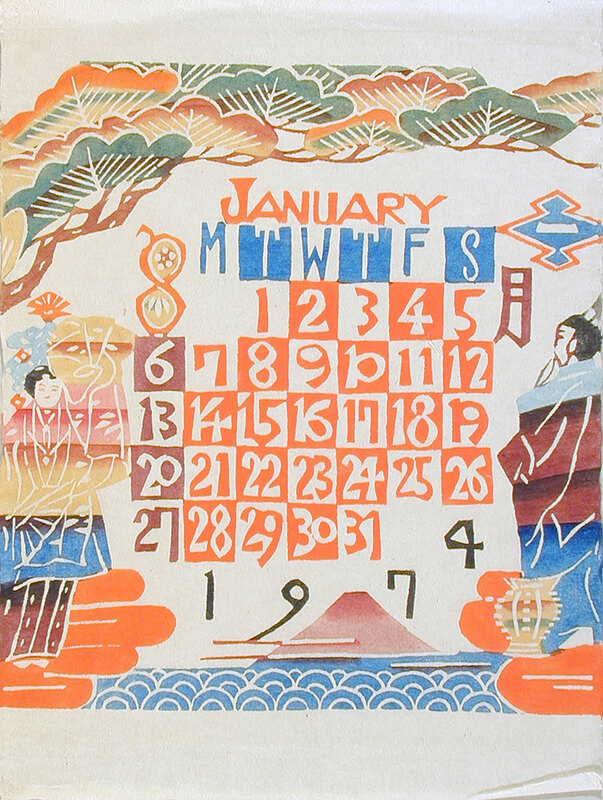 Paper provided a cheaper medium than cloth during the scarcity of wartime, and in the following years Serizawa began producing stenciled calendars like this one. Serizawa’s stencils were later called kataezome, which distinguishes the pictorial quality of his work—e meaning picture in Japanese. 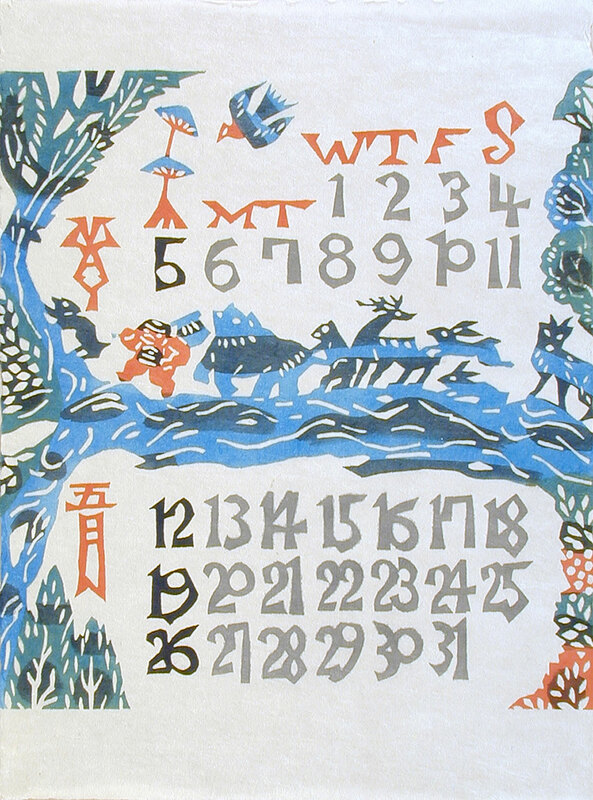 In the 1974 calendar, while every month has similar elements, each one also maintains a unique style, with distinct sets of colors and images. In the January calendar, for example, orange is the dominant color, providing a patterned board upon which the dates are alternatingly carved into or out of. The orange is echoed in the foliage of the trees that sprawl above the calendar, and underneath the two figures that flank the grid of dates on either side. Despite the profuse design, the images themselves are minimal in detail. In the calendar for the month of May, while orange accents are visible, blue is the dominant color. The neatly patterned grid from January is abandoned, and a procession of figures walks straight through the second and third weeks of the month on what ambiguously resembles a path, a tree branch, or perhaps a river. A bird flies overhead, drawing attention to the misalignment of the weekday letters. Serizawa was associated with mingei, a folk art revival movement that was established in the early decades of the twentieth century. The movement lauded ideals of the anonymous craftsperson who made inexpensive objects that served daily utilitarian purposes. In this case, Serizawa is not anonymous, but his stencils exhibit several characteristics of mingei. While mingei looked for beauty in everyday objects, Serizawa’s calendar makes every day into a thing of beauty. As we approach the final days of January, time marches on, much like the figures who cut through the May calendar. Here’s to beautiful days ahead, whether neatly organized or eclectically crafted.